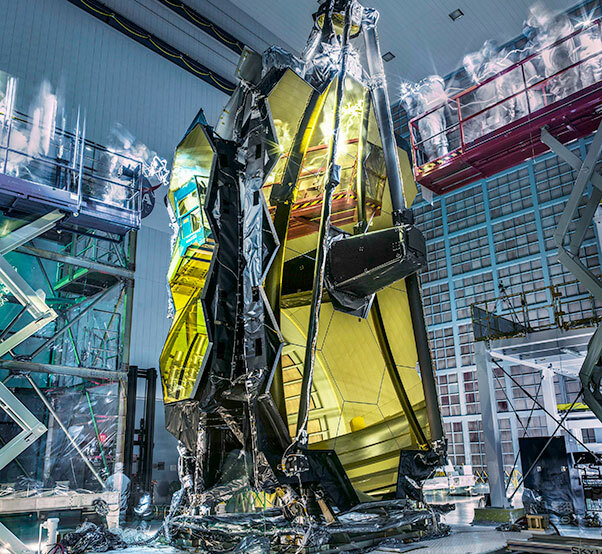 What happens when the lights are turned out in the enormous clean room that currently houses NASA’s James Webb Space Telescope? 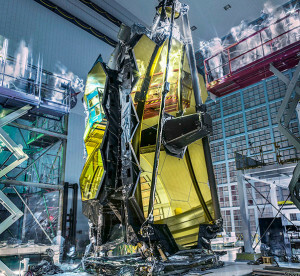 The technicians who are inspecting the telescope and its expansive golden mirrors look like ghostly wraiths in this image as they conduct a “lights out inspection” in the Spacecraft Systems Development and Integration Facility (SSDIF) at NASA’s Goddard Space Flight Center in Greenbelt, Md. 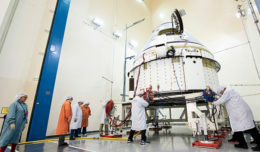 The clean room lights were turned off to inspect the telescope after it experienced vibration and acoustic testing. The contamination control engineer used a bright flashlight and special ultraviolet flashlights to inspect for contamination because it’s easier to find in the dark. 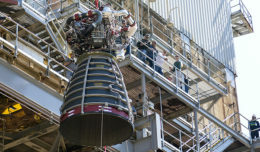 NASA photographer Chris Gunn said “The people have a ghostly appearance because it’s a long exposure.” He left the camera’s shutter open for a longer than normal time so the movement of the technicians appear as a blur. He also used a special light “painting” technique to light up the primary mirror.